Winter home staging tricks are just as essential as summer and springtime. The general belief is that warmer months are the best time for putting your house on the market, but did you know that winter is a great time to sell? While the season has its own unique set of challenges, you have a better chance of getting your home sold due to less competition. All it requires is staging with a bit more creativity than the spring and summer seasons. By adding the cozy factor, paying attention to details, and highlighting seasonal features, you can make your property really stand out. To help you, we point these winter home staging tricks that will make your home's showing pleasant and enjoyable for your buyers. Since buyers may visit your home in the evening, make sure your home is bright and well lit. The angle of the winter sun may be such that your house feels dark, so open the curtains and drapes throughout the house in the daytime. Thoroughly clean all light fixtures, lamps, and bulbs to ensure good home lighting. If required, invest in fixtures for the areas that need more light. 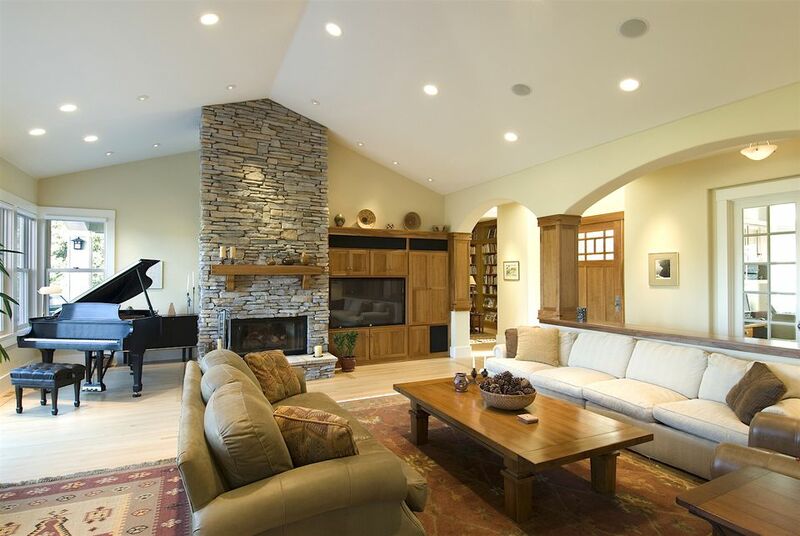 Adding lamps, recessed lighting fixtures, and drop lighting can make all the difference in how warm and inviting your house feels. Winter cleaning is often forgotten once the weather gets cold, but when your house is listed for sale you absolutely must clean and organize every area in your home. Skipping this step in your home staging efforts could cause potential buyers to pass on your house altogether. From gleaming window and shining floors to clean counters every surface should sparkle. Also, clear away all clutter even if it may require utilizing offsite storage temporarily. Declutter and organize every cupboard and closet to create more space in the eyes of the potential buyers. Use organizational tools such as cubbies, bins, baskets, and trays to store daily use items. Take a look at these closet organization ideas you may not have thought of! Fireplaces are important interior elements and can be a great focal point in your home. Not only does a modern fireplace instantly become a breathtaking eye-catching feature for any area, but due to advances in energy efficiency, they have become more cost effective. Whether you want to retrofit and older fireplace or you decide on installing a new one, consider investing in a functional fireplace, rather than a symbolic one. The most popular fireplace trends is an ethanol-burning fireplace because of its effortless maintenance, minimal looks, and flexibility. Alternatively, you can opt for a mirrored glass fireplace which is perfect for a spacious, light filled home. Winter is the season for celebration and that gives you a good reason to put up some holiday decorations to give your home a happy, cheerful, and a friendly vibe. But this is not the time to decorate your house like a Christmas tree. Loudly laughing Santas, noisy symbols, and bright colored decorations are better scaled down or not used at all. Instead, neutral decor, some twinkling lights, one or two simple wreaths, and a small Christmas tree will strike the right note. Remember that winter decorations are fine and can even help you sell a house provided they add elegance and warmth. If you choose to skip holiday decorations consider adding warm and fluffy textiles like drapery, throw blankets and area rugs to bring in warmth to your interiors. Warmer months may still be the peak home shopping season, but it actually pays to list your house in winter when there is less competition and the buyers tend to have more urgency. If you do not have the luxury of time to wait until spring, use it in your favor by following these winter home staging tips.